A few hours from now, CMS should be releasing the HealthCare.Gov Week 12 Snapshot report. As noted last week, the "pre-purge" factor has completely messed up my projection model this year, since the numbers for weeks 1-10 could have been lopped down by several hundred thousand people (nearly 250K of which were confirmed to have happened in Week 11 alone). While the purge numbers for the previous 10 weeks were likely much smaller, it still screws up my methodology. If the Week 12 number = ~400K after subtracting cancelled enrollees, then I'm still projecting the final OE3 tally to come in at anywhere between 13.6 - 14.0 million. If, however, it's ~400K before cancellations are subtracted (and the number drops substantially as a result), then my final call will likely be only around 13 - 13.5 million. Of course, that 3x factor could be off as well. 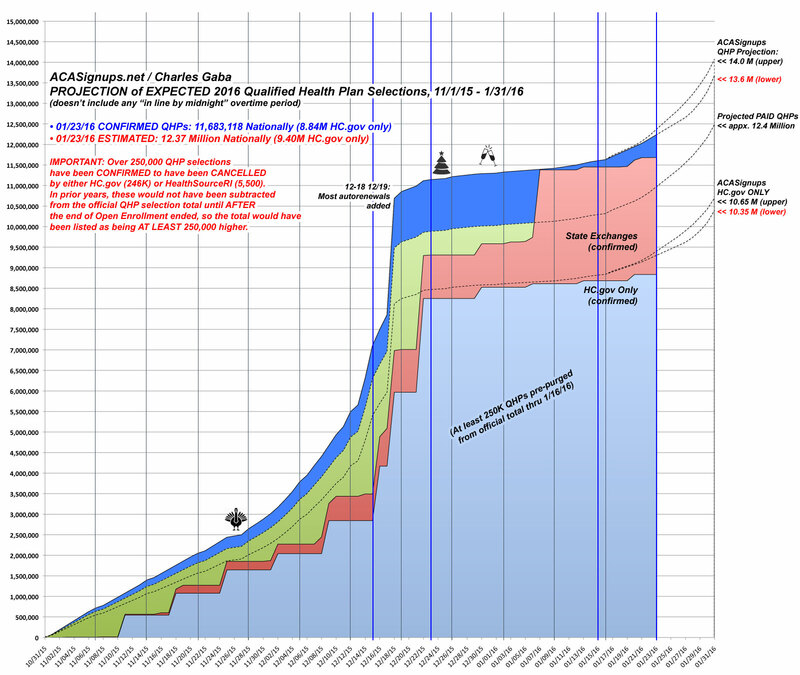 Last year, HC.gov had 276K QHPs in Week 12 for a cumulative total of 7.75 million...but the final HC.gov total was 8.84 million. About 1.09 million people signed up in the final week + overtime period, or nearly 4x as many people. This year, I suspect the "overtime" period is unlikely to happen, so I've dropped the surge factor to 3x...but we'll have to see.